Check out this great very large rustic country barn with lots of extra doodads and an attached garden shed. A great country cottage door painted in a wonderful forest green. It is HUGE and very very heavy. An amazing centerpiece for your primitive decor. An exciting piece of art for your garden. It will definitely make a statement in your garden or your home. The great barn red patina came out amazing. A great grungy American flag. Beautiful piece of 100 year old cypress surrounding the entrance hole. Original paint remains on piece of wood. There are lots of special features on this barn birdhouse. There are 3 large seperate nesting boxes. The entrance holes are on the side for the two outer boxes. 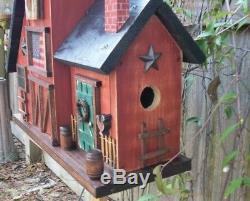 The middle birdhouse has the entrance in the front. The center birdhouse has the barn doors made of old wood strips. All the wood trim is stained a black cherry walnut stain. The roof is painted a flat black with a great grungy finish. A unique addition to your birdhouse collection. The base is stained is also stained im black cherry walnut stain. If you are looking for a unique birdhouse for your primitive decor in your home. This large barn birdhouse might be it. My birdhouses are made to last for years in every environment. 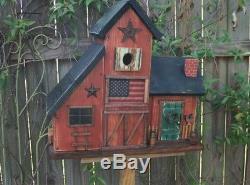 The birdhouse is 19" tall x 19 1/2" wide and 9 deep. I M P O R T A N T. This birdhouse is made to order. Estimated 5 to 7 days to complete and drop off at the post office. The item "Large Primitive Folk Art Country Farmhouse Barn Birdhouse" is in sale since Monday, August 20, 2018. This item is in the category "Antiques\Primitives". The seller is "acountryway" and is located in Plaquemine, Louisiana. This item can be shipped to United States.